Parallel Space WhatsApp – Are you looking for a simple way to Install Dual WhatsApp or 2 WhatsApp accounts in one phone? This is the right place for you. Here in this article, we will let you know How to Install Parallel Space WhatsApp Download and use Parallel WhatsApp accounts in one phone. Have you ever thought of using Dual WhatsApp accounts in one mobile phone? Is it possible to do so? Yes it is. You can achieve this using Parallel Space. Parallel Space is an excellent app for using Dual accounts in one phone. You can get access to Parallel WhatsApp, Multiple Twitter accounts, Instagram account etc and you can even play your favourite games from dual apps with multiple accounts. Recently few of the applications launched multi-account maintenance feature. Earlier Facebook and now Instagram also added this feature to their apps and made things easy for switching between multiple accounts. WhatsApp officially hasn’t have this feature till now. For those apps who doesn’t allow you to have multi accounts, you can use Parallel space. There are quite a few ways for use Dual Whatsapp or 2 WhatsApp accounts. Out of which Parallel space WhatsApp is very popular among android users. Parallel space app is freely available on Google Playstore. 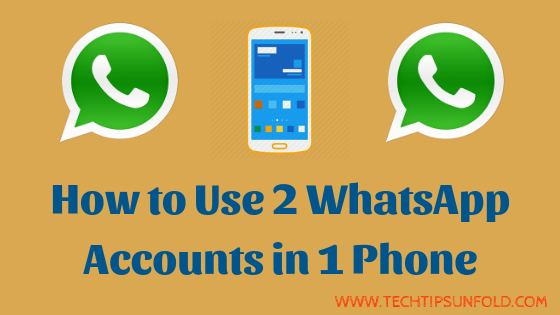 In this article, we will see two simple methods to use 2 WhatsApp accounts in single mobile phone. We will list down 2 possible methods along with its pros and cons. Parallel space is one of the top rated android app to run multiple accounts simultaneously. It creates a separate space where you can install already installed apps as well. It will treated as an another phone with disk space and RAM. Parallel Space app is 100% safe to use. It won’t contain any malware. You need to give access to few of the permissions for seamless experience. Download it officially from Google Playstore and enjoy the EXTRA SPACE. Parallel Space has stunning 100,000,000+ installations on Google Playstore and loved by most of the Android users. It has 4.6 star average user rating. Currently it is second topmost (Top 2) App in Personalisation category. Now let’s start our Step by step guide on Parallel Space WhatsApp Download and Install to use Dual WhatsApp accounts. Step 2: Once you click on the above link, it will take you through Parallel space app page in Google Playstore. Just click on the Install button you will find there as shown in the image below. Step 3: Now it will asks you to allow few permissions like Mobile Data settings, Calender, Contacts, Location, Phone, Camera, Microphone, Bluetooth, WiFi connection, Device ID information etc. Click on the Accept button in the end with green colour. Step 4: It takes few moments to Download and Install Parallel space depending upon your internet connection speed. After successful installation, Just launch the Parallel Space App on your mobile phone. Step 5: Clone Apps screen will appear now. It will show you the list of apps installed on your phone and you just click on for whatever the apps you need Dual account. In our case just select WhatsApp account to create WhatsApp 2 and tap on Add to Parallel Space option at the end. Step 6: Now WhatsApp 2 is succesfully added to your Parallel space. Click on the WhatsApp 2 icon to open it. Go ahead and install if Parallel space asks you for 64 Bit support. Step 7: Remaining procedure is similar to How we install normal WhatsApp app. Initially you need to Agree to their terms and conditions and then proceed to continue. Step 8: Choose your country and enter your mobile number for Parallel space WhatsApp 2 account. Tap on the next button. Step 9 : Now you will receive an SMS to that mobile number with PIN. Enter that pin and Voila! Parallel WhatsApp is successfully installed on your phone. This is the detailed step by step guide on Parallel WhatsApp download and create 2 whatsapp accounts in 1 phone. You can use all the feature normal WhatsApp provides you in WhatsApp2 Account as well. You can Hide WhatsApp Chat, WhatsApp Wiki, Status updates, Google drive chat backup, Group video calling, UPI payments etc without any issues. Now we will address few common questions and doubts regarding Parallel WhatsApp. Q. Can I use the same number to install WhatsApp 2 Account? No. Parallel space WhatsApp phone number should be different one from main WhatsApp number. Q. How can I uninstall apps in Parallel space? Go to the home screen where you will find list of installed apps in Parallel space. Long press on the app icon and drag it to the Delete button on the top. Q. Does my phone need to be rooted to use Parallel Space WhatsApp? Nope. You absolutely don’t need to root your phone to use Parallel space app. It just creates an another space for you to run multiple apps simultaneously. Also Parallel space requires very little amount of Memory to run on your phone. Parallel space app also provides you lots of customisation options and theme settings for any apps. If you are theme lover and wanted to set your favourite theme to any app’s background, then Parallel space is for you. You are gonna absolutely love it. Parallel WhatsApp use low memory and battery. Even if runs in the background all the time, no need to worry about draining battery. That’s all about using Dual WhatsApp account using Parallel space app. Now let’s discuss another simple method which lets your run Parallel WhatsApp accounts in one phone. These days, most of the mobile phone manufacturers coming up with inbuilt feature of Dual Apps. Following are the list of mobile phones with Dual space feature. Step 1: Open your Android phone and go to Settings. Step 2: Scroll down a bit and you will find Second Space option under System & Device section – Refer to the below image. Step 3: Click on the Second Space and in the next screen tap on Turn On Second Space option. Now a new second space will be created on your phone. Step 4: Select Continue option and set a password. Wait for some time and you will get brand new version of your smartphone in second space. Step 5: Find Google Playstore in Second space and search for WhatsApp. Step 6: Choose Install option to Download Parallel WhatsApp 2 on second space. Step 7: Upon completion of installation, Launch the WhatsApp app and register with your mobile number. Now onwards, you can use it similar to how you use WhatsApp regularly. Q. How to Navigate to the First Space – The main screen? You will find option to switch between primary and second space in the notification bar. You will even get a shortcut to switch between account in the home screen. Simply tap on that to go to primary space. As mentioned above there are two methods available to use Dual Whatsapp in one mobile phone. If you have MI / Samsung / Honor mobile phone with you, better to follow the second method as it is the inbuilt feature provided by mobile phone manufacturing companies. So they will take care of optimisation techniques and security vulnerabilities. If you are not using any of the listed mobile handsets, then opt for the regular method i.e. using Parallel WhatsApp account using Parallel space app. Download the app from Google playstore link only. It is also an official method and 100% safe to install on your phone. So install parallel whatsapp and feel convenient to switch between the social media accounts. I’m concluding this article on Parallel Space WhatsApp. If you are still facing any issues installing it and using WhatsApp 2 account using Parallel space, do let us know through your comments. We will be glad to help you in this regard. Cheers! Want to use Dual WhatsApp accounts? Parallel space is there to rescue you. Parallel space allows you to run the same app with different accounts on the same phone. Depending upon the phone model you use, choose from the methods listed to Install Parallel space WhatsApp and avail 2 WhatsApp accounts in one phone.